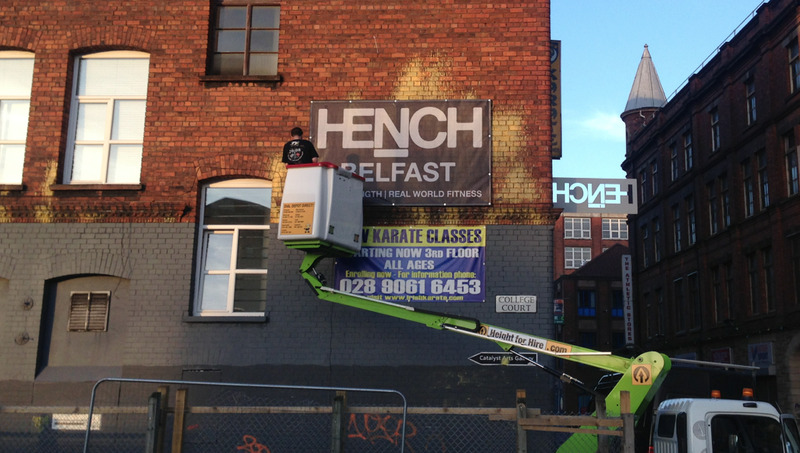 As a member of Hench I can only say good things about this Belfast City centre based gym. Firstly, I only found out about it because it is situated in a building that housed one of Irelandâ€™s longest running traditional printing companies. One that printed the first edition of The Lion, The Witch and The Wardrobe. Long before Kaizen I might add. Secondly, Rory and his team of coaches, Sean, Gary and Ciaran are 100% focused on helping the customers of Hench get fitter, stronger and mentally tougher. Something which will benefit them both inside and outside the gym. Based on the first floor of an old building out the back of Queen street, above Catalyst arts and below Breens Boxing gym, Hench wanted to address a visibility problem. It wasn't the easiest place to find even if you kind of knew where it was. With this in mind, we stepped in to help. The above photo is of a 10ft x 6ft mesh banner installed on the outside wall of the Hench gym. Since its install is facing the bottom end of Great Victoria Street, it will help customers and potential customers find the gym with a little more ease. It will also serve as a marketing opportunity for those interested in strength based training to find a gym that focuses its gains on â€œReal World Fitnessâ€. Hench run an open gym, but also organise Small Group Training across a variety of workout goals. Each, while extremely taxing on your body in a different way, is super enjoyable. Aspiring to be better, to do better and working hard with like minded people ensures you are 100% focused and pushes you to the next level. It is very very effective and something I thoroughly enjoy. Speaking to me after the install, Rory Girvin owner of Hench had a lovely review of Kaizen for this blog post. Connor from Kaizen goes well above what I would expect as exceptional service. From simply chatting about marketing ideas and opportunities, then bringing these to life as with this banner, he and his team are pretty awesome. We have some other amazing projects lined up for Hench in the next few months, so please do remember to keep checking back at our blog regularly. Or if you are so inclined, you can drop us an email and ask to be put on our mailing list. We send out a single email each month, with examples of our work, ideas for marketing for the month ahead, as well as anything we have spotted online, that could possibly be of interest to you. Have a great day!